72% of India’s population lives in rural areas yet has access to only 33% of all available healthcare beds. That one statistic tells a story of apathy and neglect. Farmers are out there under the sun, season after season, year after year, toiling to fill our granaries. But are we doing enough for the hands that feed us? For SF Sonic the farmer has been a vital customer. Our R&D has always made the big push to make tractor batteries better and more powerful with each subsequent product release. Every ounce of energy that we can extract to help him in the field, we believe, will make a difference. But that alone is not enough. So this year we have rolled out a special programme that will reach out to 25000 farmers all over India in the next 12 months. It’s called “Zamindar ka Doctor”. 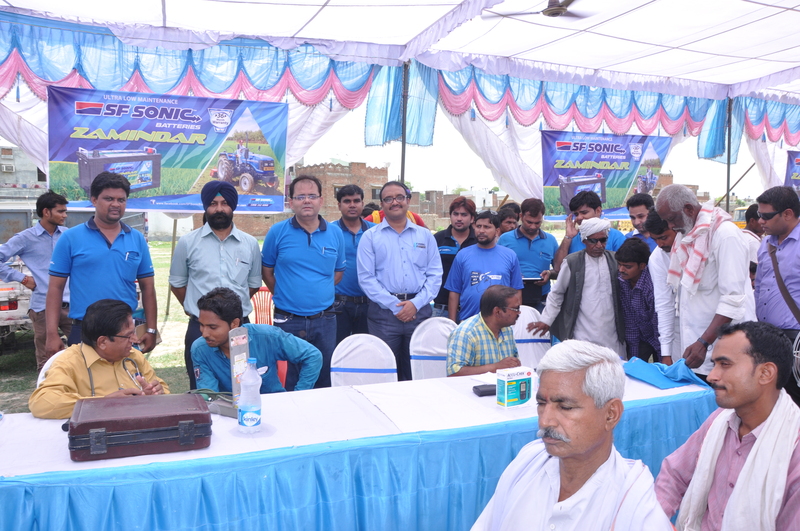 Under this programme we are giving a free medical check-up to farmers along with a free battery check-up for tractors. Even a simple programme like this can go a long way in bringing a focus of health for the farmer. Currently 75% of the total rural population has to travel beyond five kilometers to access basic healthcare services. A basic medical check-up is a good beginning to better health. Blood-sugar, hypertension, blood-pressure, lung conditions are all diseases that ail rural areas as much as urban. This kind of medical check-up helps bring much needed attention to the health -related issues. Each camp that we conduct has a patient learning part where farmers are informed of the gaps in their health management. On another note a free battery check-up also means a lot for the health of the tractor. Most farmers do not understand the need for proper battery maintenance and how it helps them be more productive with their tractors. This check-up is an opportunity to provide useful tips on how to keep the life of the battery long and strong. Zamindar ka Doctor was launched on 23rd June 2015 at Fatehpur in UP. 125 farmers got a medical check-up done. And 103 tractors got batteries checked. It is a perfect beginning to a year long commitment from SF Sonic. Out team is going to travel all over India covering every major region, travelling deep into the interiors of the country. We are bringing our message of good health to every farmer we meet. And very tractor we service.